Eeeek! Halloween is just around the corner! I am having so much fun pulling out all my spiders and skeletons and other spooky stuff. 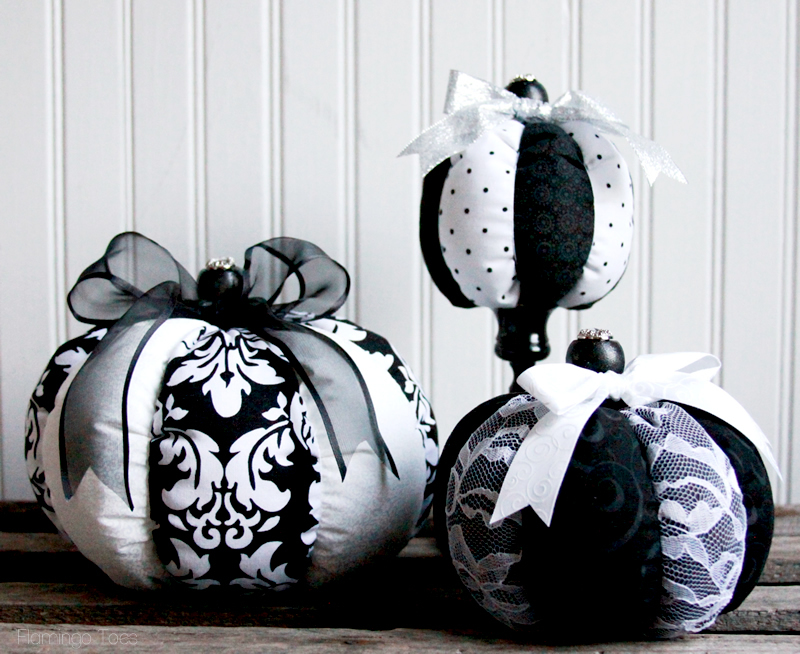 I’m working on making some new things too – like these fun DIY Striped Fabric Pumpkins! 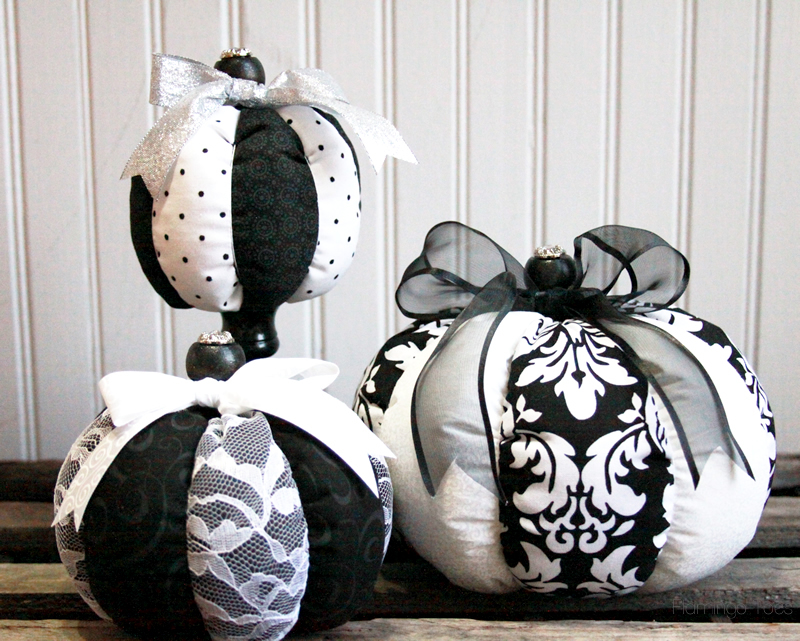 I’ve been wanting to make fabric pumpkins for a while now, and I thought it would be fun to make up some in these sweet black and white fabrics. 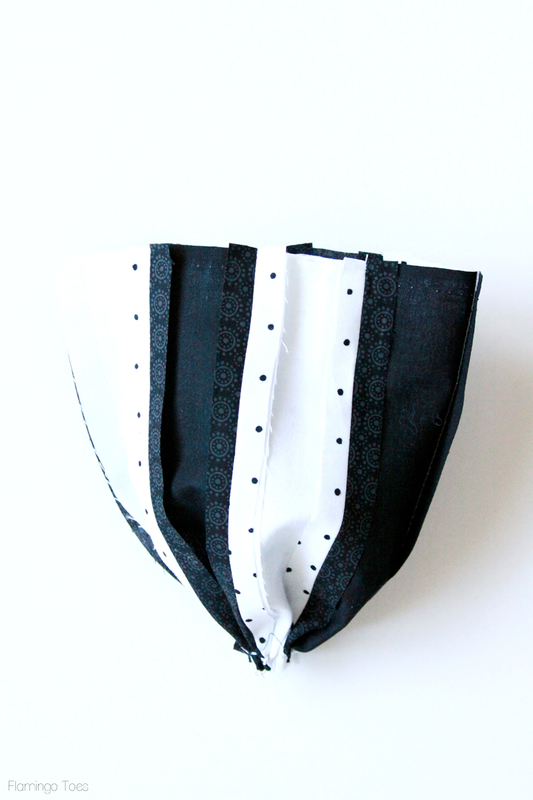 These striped pumpkins are super easy to sew up too. Just a little machine sewing and then you can sit in front of the TV and finish them up in no time! 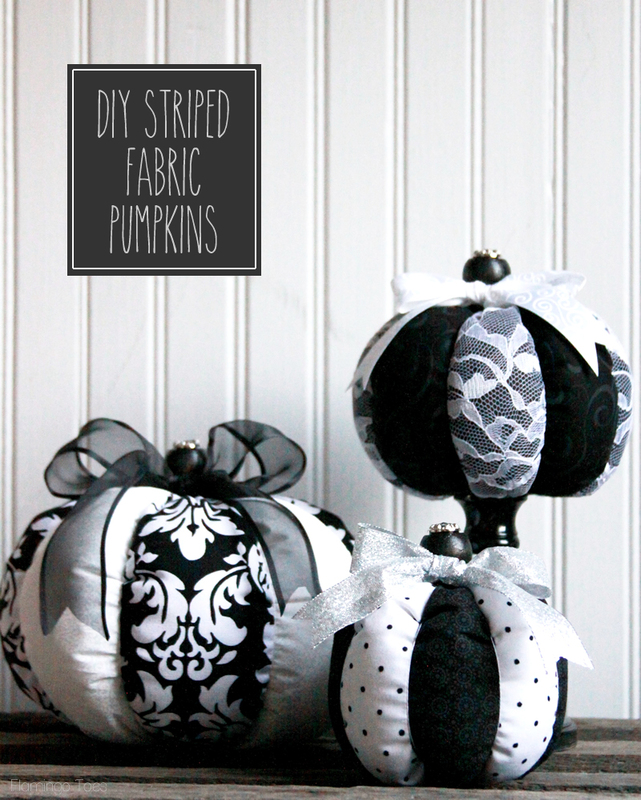 Begin by cutting out the strips of fabric for each pumpkin. 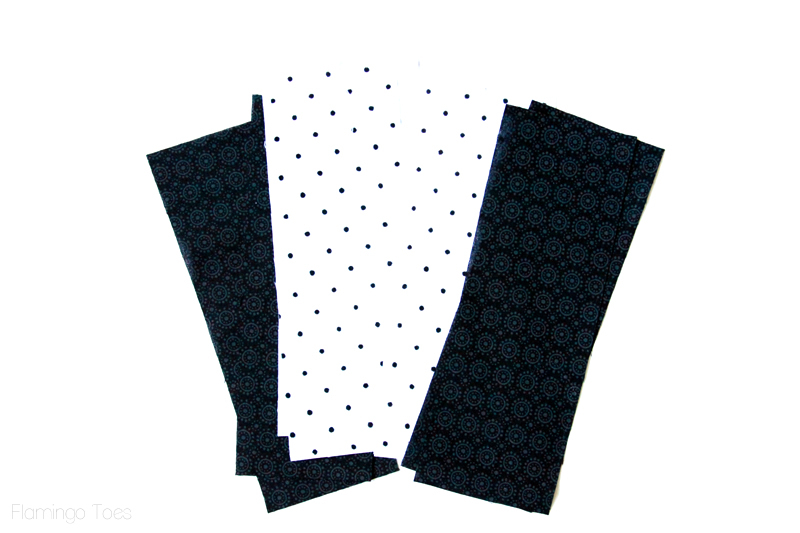 Sew the strips together with a 1/4″ seam allowance – making sure if your fabric is directional that they face the right way. Sew the two ends together to make a tube. Thread your large needle with your embroidery thread – run a gathering stitch along the bottom and pull the thread up tight to close the opening. Knot the thread. Turn the fabric right side out. Run a gathering stitch along the top, but don’t pull the threads tight yet. Stuff the pumpkin with fiberfill. Pull the thread at the top almost tight, then add a little more fiberfill. You want the pumpkin pretty full. Finish gathering up the top and knot the thread. 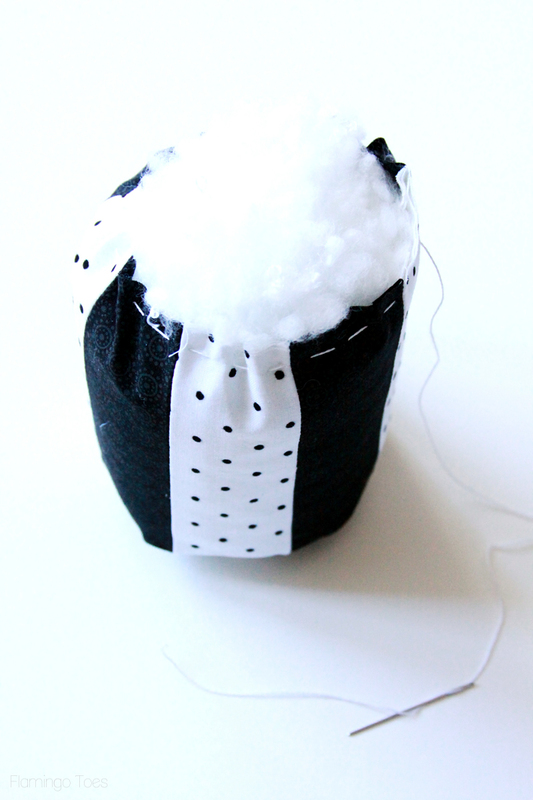 Using more embroidery thread, make a small stitch in the bottom, then pull the thread around to the top along a seam. Holding the thread tight, take a little stitch and knot the thread. 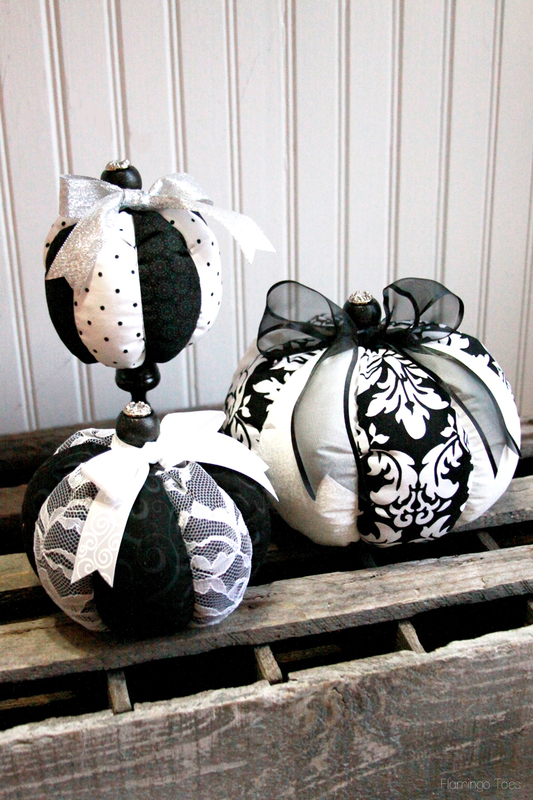 Repeat for all the seams – pulling the thread tight each time to give it that pumpkin shape. 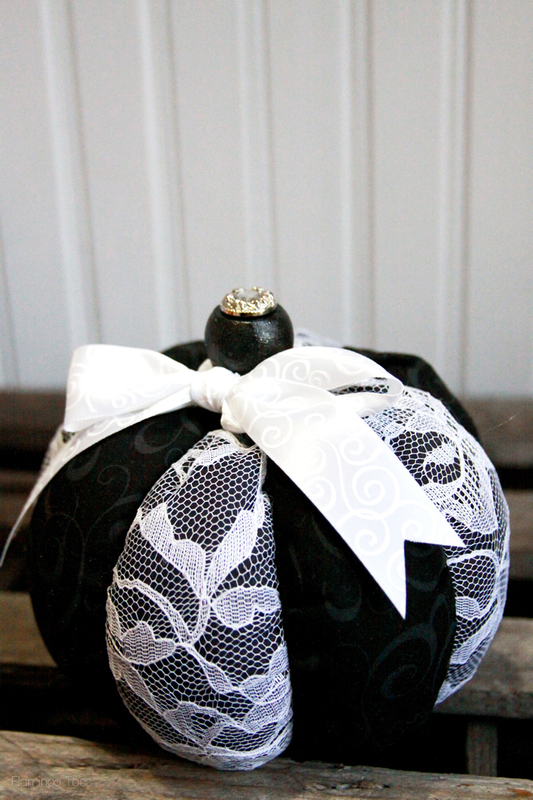 Glue a large flat pumpkin to the bottom of the pumpkin, which is cute and as a bonus covers up all your stitching. If you are using the wooden end caps as your tops (I found these at Walmart), paint the pieces black. 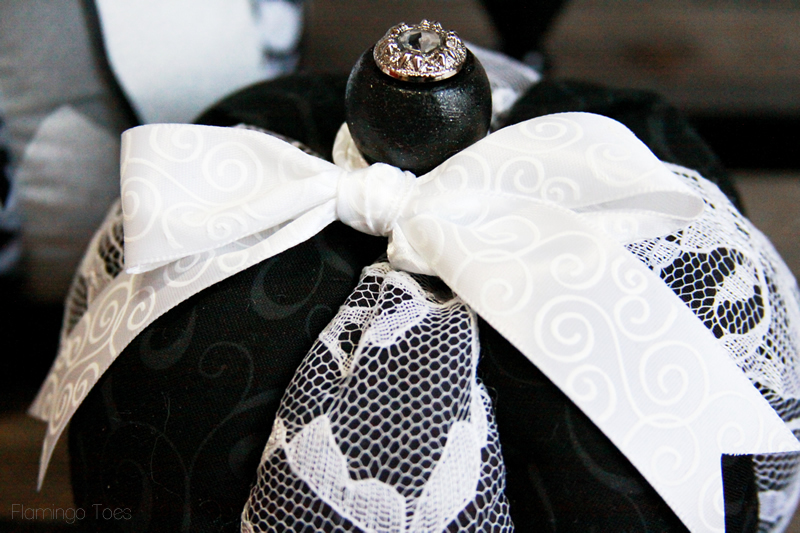 Cut the shank off of a glittery button and glue to the top of the cap. Boom. Instant glam. 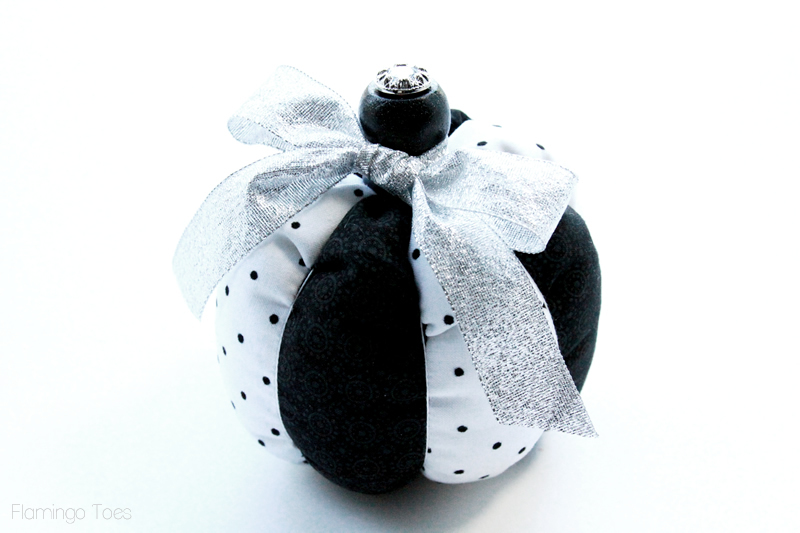 Glue the cap in place on top of the pumpkin, then tie a ribbon bow around the cap to finish it off! Repeat for any other pumpkins you’d like to make. It’s even faster after you make one so you might just get carried away! I love the little touch of glitter these have! Found this on pinterest and love it thanks for the sewing tutorial. Gonna have to make one, two ore more. 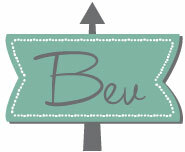 SO super cute, Bev!!! You make them look super easy to make. :) I LOVE them in black and white! 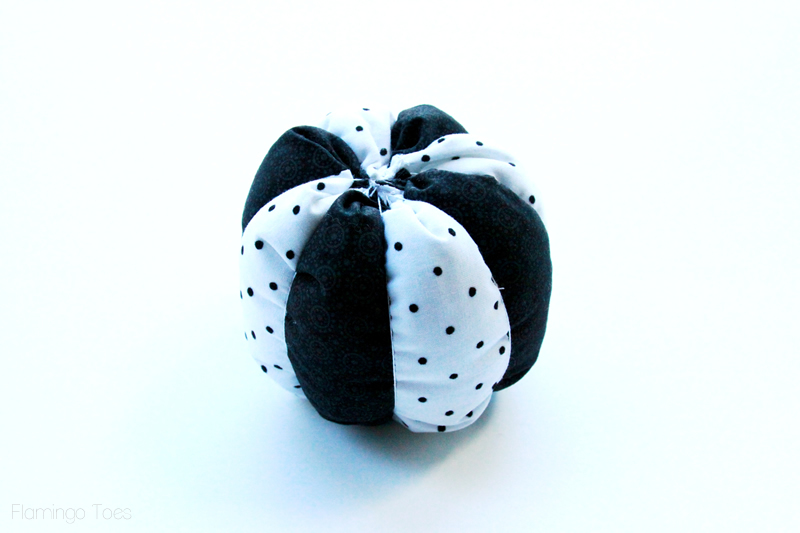 I have made a few different fabric pumpkins and this is my favorite. Turned out super cute! I like using a drawer pull it gives it a shabby chic look. Thanks Shawna! I’m so glad you like them! 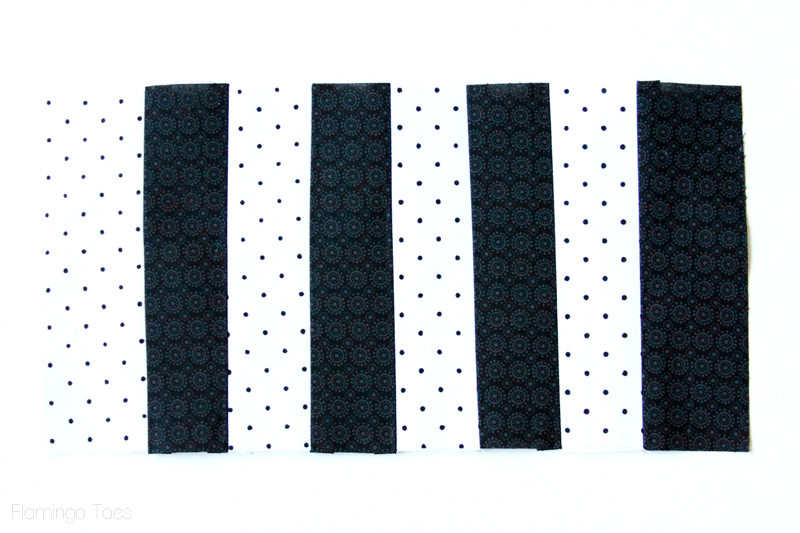 Using a drawer pull is a fabulous idea – I am planning on making up more in other colors and I think I’ll try that! 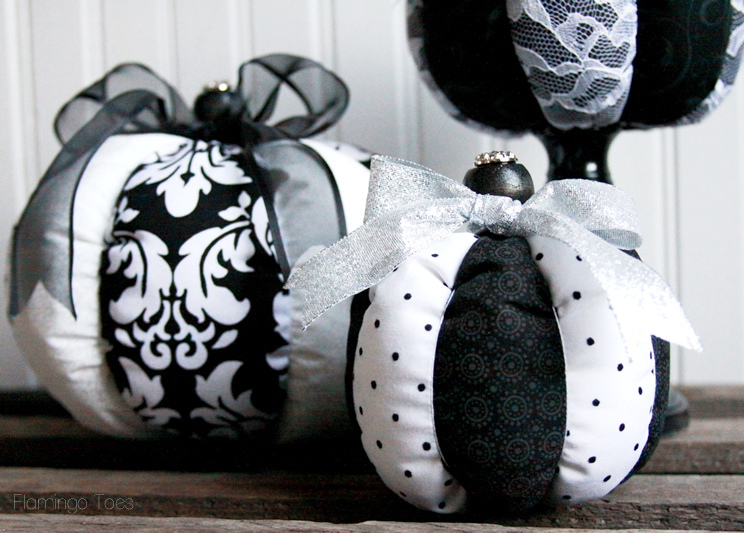 I’m making these for Christmas! Super cute holiday decorations! Thanks for sharing. I made a variety of these in orange, blue and greens. They were so much fun! These are really cute, but do you make vertical gathering stitches? The directions are not clear at all.